Welcome to the world of BABY SKATES - GIFT SERVICES where we try to make a great gift even better! As you scroll down through this page you will notice that after many requests we are now making available our cute BABY SKATES - GIFT CERTIFICATES in (4) different dollar amounts. Our Gift Certificates include a really adorable card with matching envelope for your special occasion! Our other service that we are now offering is for the ULTIMATE SURPRISE GIFT WRAPPING, where we dress up your package of BABY SKATES in the cutest style of wrapping available and complete it with a bow and card. Then we sneak your wrapped package into a bigger ordinary (plain-Jane) shipping box with either foam peanuts, bubble wrap, or cushioned paper. They open the plain-ordinary shipping box, and WOW out pops up the WRAPPED PACKAGED OF BABY SKATES! SURPRISE! IF YOU JUST NOT SURE ON THE SIZE AND WANT TO KEEP IT A SURPRISE THEN GET THEM A BABY SKATES - GIFT CERTIFICATE! We at BABY SKATES are very excited that we now offer Gift Certificates! We have (4) different Gift Certificates to choose from, in the following amounts; $50.00, $100.00, $150.00, and $200.00. All BABY SKATES Gift Certificates will come with a cute card and matching envelope which can be used for anything on our web site including our cute engraving and shipping costs. When using our Gift Certificates you will either need to use the entire amount or be given a remaining balance slip for any left over amount. Our Gift Certificates can not be returned or exchanged. All of our Gift Certificates will have a (2) year Expiration Date from the original date of purchase and all remaining balances will go by the original (2) year date. All Gift Certificate amounts will be issued and redeemed in U. S. Funds. The items that we have selected for gift wrapping are very cute and will make for a wonderful gift or surprise! 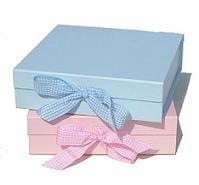 For the Ultimate Surprise we offer a very cute gift wrapping for either a Girl or Boy. We wrap you package of BABY SKATES in a cute color coordinated gift wrapping paper for either a Boy or a Girl which includes; the gift wrapping paper, a bow, and a card. Then we put your gift wrapped package into a larger-plain shipping box, once the box is opened they will be surprised! YOU WILL NEED TO PAY FOR SHIPPING AND HANDLING ON ALL PAIRS OF BABY SKATES - THIS IS AN ADDITIONAL COST FOR ULTIMATE SURPRISE WRAPPING!